Back in July, while the members and supporters of Ottawa Renewable Energy Co-op were hoping for the best under the newly elected Progressive Conservative Party of Ontario, they were also preparing for the worst. When the Independent Electricity Systems Operator (IESO) issued cancellation notices to 758 renewable project contracts, it was a blow to the momentum that the Co-op’s members, supporters, and staff had been working to create. Four of these cancelled contracts were held, either exclusively or in partnership, by the Co-operative. 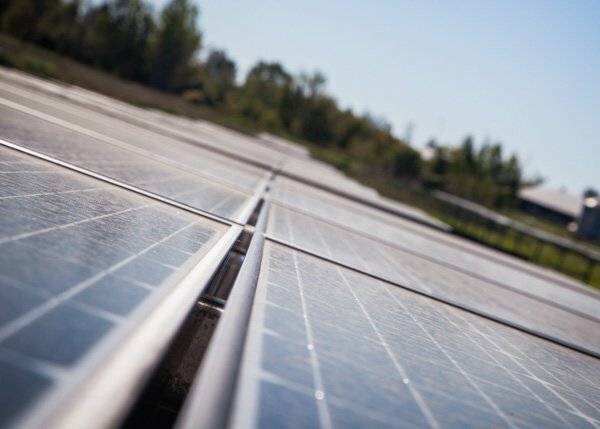 Today, however, the Co-operative can claim a victory for community-financed solar in Eastern Ontario. The Co-operative has agreed to terms with long-time partner, the Conseil des écoles catholiques du Centre-Est (CECCE), on two of the projects which had been axed by the provincial government in August of 2018. A 3D rendering of the Mer Bleue rooftop project. A 3D rendering of the Paul-Demarais rooftop project. The projects will be located on the roofs of École Secondaire Catholique Paul-Desmarais and Collège Catholique Mer Bleue, high schools located in Stittsville and Orléans, respectively. 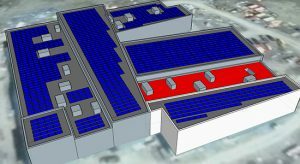 The FIT contracts originally secured by the school board and the Co-operative would have seen a 250-kW project put on the roof of Paul-Desmarais, and a 400-kW system installed on Mer Bleue. 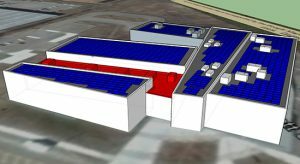 No longer constrained by these contracts, however, the Co-operative and CECCE could increase or decrease the capacity of these projects, depending on roof space and grid capacity in the areas where both schools are located, among other factors. Those details are still being discussed by Co-operative staff and school board decision makers. Many were concerned that with the cancellation of so many renewable energy projects, along with the end of the Green Energy Act, the future of renewable energy in Ontario was grim. These projects tell a different story. The reality is that solar power projects can now produce electricity at parity with grid rates, and the situation is due to improve as the cost of solar and storage technology continues to fall. Members of the Ottawa Renewable Energy Co-operative, as well as non-members living in areas such as West Québec, will be able to invest in these projects and others during the Co-op’s upcoming investment offering. Subscribe to our newsletter and follow us on social media (Twitter or Facebook) to keep up to date on when that becomes available. It’s good news that 2 projects were revived, but what are the implications of the other two not being salvaged? Besides less solar energy production, will it impact our dividends this year? OREC won’t be able to salvage the other two products as you point out, but this will not negatively impact dividends this year. We are taking recourse to receive appropriate remuneration for the work that was carried out on those projects before they were cancelled. But as mentioned, these cancellations will not affect dividends this year. Will you be sending out an update to investors who put in funds this past summer for these projects regarding how their funds will be invested and the dividend schedule? I’m still not clear on what to expect. Thank you.